The VJM10 marks the 10th year of competition in Formula One for Sahara Force India. It succeeds the VJM09, which had been the most successful car in the history of the team. However, the big regulation changes that were introduced meant little could be carried over to the new car. The car was launched on 22 February in the team's traditional silver and orange colours. It was only on 14 March, after pre-season testing, that the team revealed the signature of BWT, a new major sponsor for the team. 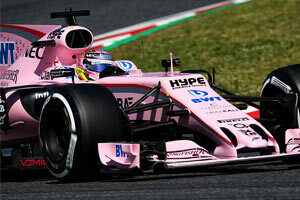 The deal with the water technology company meant a radical switch to a bright pink livery with also both the team's racing drivers to use pink helmets for the duration of the season. The VJM10 is the team's first for which the monocoque chassis was constructed in-house. The change was marked as a large improvements for the team, with which it claimed it has gained as significant amount of time, while, according to Otmar Szafnauer, also resulting "in the best quality chassis" the team ever product. The team had also expanded its machining shop to allow for greater freedom to control the production of the mechanical components". The car features some visual resemblance to its predecessor, retaining the unique nostrils in the nose as the most obvious element, and a rather blunt kink on the upper surface when the nose cone meets the monocoque. The car has a familiar sidepod shape and copies Mercedes' wide airbox solution of 2016 to house the Mercedes engine for the 9th year in a row. Other that this, the car's looks are defined by the regulatory changes. More in the car's launch analysis.